I must at least tip my hat to the impressively named Shenzhen Simeng Technology Company. They’ve come up with a perfect PUBG knockoff title. ‘Battle For The Last Chicken’ says it all, whether it wants to or not. It even goes so far as to explain why up to a hundred lunatics want to fight to the death over a chicken dinner. Sadly, the name is just about the only thing going for Battle For The Last Chicken, if its official gameplay trailer is any indication. 2017 has been an amazing year for PC gaming. I don’t care how starved you are for VR stuff to play, you’re still better off picking something from our Best Of 2017 list than shovelware like this. What we’re looking at here is, in essence, a threadbare shooting gallery the likes of which you can find clogging up just about every VR-centric corner of Steam, dressed up in the familiar aesthetics (right down to replicating a few notable scenes with surprising accuracy) of the battle royale shooter we all know, and many of us love. They have at least done a decent job of making it look and sound like PlayerUnknown’s Battlegrounds, but that’s about the length of it. 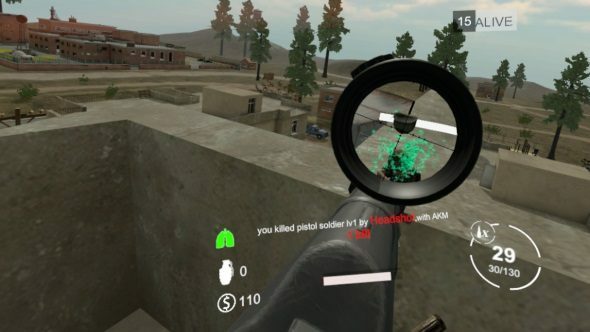 It’s a pity, because a good VR PUBG clone could be truly exciting, and might lead to some impressively dynamic firefights. Or, at the very least, make lying prone in a bathtub and hoping that nobody checks the room properly a more intense proposition. It seems only a matter of time until one comes along, of course; Perhaps there is one, and I’ve just not heard of it yet, but sadly, there’s not much reason to look at this as anything more than a curio with a good title. On a more serious note, while Battle For The Last Chicken could be easily enough written off as parody (the title is at least a solid indicator that you’re not getting the world-famous blockbuster), ever since retiring Greenlight in favor of a simple paid entry fee, Steam has seen a recent influx of hastily assembled shovelware released under titles clearly intended to draw clicks away from the game that you’re probably searching for, such as ‘PLAYERUNKN1WN: Friendly Fire‘ and ‘PLAYERUNKN4WN: Zombie‘. The latter is especially galling, as it’s a rehash of the same low-fi Unity stock survival shooter template that saw so much abuse in years past. Battle For The Last Chicken is available via Steam for £4/$5, if you’ve really got nothing better to do, but you’re probably better off picking from our Best Of 2017 list instead.